During the week of July 4th, I visited my father in my home town, Lamesa (pop. ~10k) — situated roughly mid-way between Lubbock and Midland at the bottom of the Texas panhandle. Here are three fairly unexceptional cell-phone pix from the trip, but they perhaps reveal something about where and how I was reared, and by whom. When I drove past them in the dark on the return trip, I wondered whether each blade tip would have a warning light for aircraft, or whether each tower would be topped with a strobe. Apparently not; but there were some sort of arrays of large red lights that I think were around the base of each windmill. And all of them — at all of the dozens of windmills that would have been in sight of each other during daylight — pulsed on and off rhythmically and simultaneously. I suppose from the air, it would still be an obvious and impressive warning for pilots at night. This is a pretty good place for windmills, I'd guess. One clue as to the population density: There's no cell phone service, from any carrier, for miles and miles. In fact, across much of west Texas, including in Lamesa, my Verizon service was absent, but usually I could at least "roam" via some other carrier. Not here — neither in daytime hours or at night. After I reached Lamesa, I read that a group of farmers and ranchers closer to my home town are in the preliminary negotiation stage to lease their land for more of these towers to an affiliate of Florida Power & Light. If there's any local opposition, that wasn't obvious from the news article in the Lamesa Press-Reporter, and I doubt there is any. Lamesa doesn't have much in common with Nantucket, and Ted Kennedy would neither feel much at home there nor, frankly, be very welcome. The wind turbines, with their lease fees and additions to the property tax rolls, are. My home town's name is an anglicization of "la mesa," Spanish for "the table," and the picture just below, which I took at the far southwest corner of the town (looking toward the northwest), will give you a pretty good idea of the consistent local topography which inspired that name. 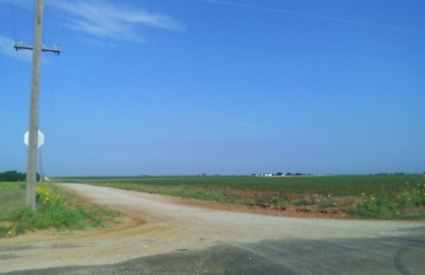 The dark green in the fields are long, straight rows of very sturdy young cotton plants, the growing of which is still the mainstay of the Dawson County economy. They were each less than six inches tall, and each about that broad across, and normally they'd have been taller and broader by July 4th, but they've been held back by above-average rains this year. If they get a long enough growing season, though, with plenty of long, hot, sunny days and without an early freeze or too much late-season rain, it might turn out to be a good year. Either way, by December these fields will be stripped brown and bare, and they'll be much more bleak looking. Until I was about eight years old, the land shown in this third photograph looked exactly like the land shown in the second. In other words, it was just another cotton field on the edge of town, owned by my grandfather, and divided among my father and his three siblings upon my grandmother's death. My father, like his father, was more of a merchant than a land-owner or a farmer, and he took over his father's hardware store after the Navy returned him to civilian life in 1946. The store moved from hardware into home furnishings and appliances by the 1960s and 1970s, and during the week my father sold Zenith TVs and Maytag washing machines, Frigidaire refrigerators and Sealy mattresses. He was the mayor for a couple of years when I was a toddler, and he served another year as the president of the Chamber of Commerce; he was also on various other committees and commissions promoting highways and water development and the like, and he was a leader both locally and regionally in Boy Scouts and the Lions Club. But my father is also a man who loves trees. And on the weekends when I was still young, he started planting them in a serious way, and pursuant to a serious plan. Pecan, peach, apple, plum, oak, maple, cedar, and others — over the course of about ten or twelve years, he dug the holes for each of the saplings with a shovel, and he mounded the dirt beds partly with a hoe and partly by hand. My job during many of those years was to spend the required hours standing with a water hose, slowly filling up each bed and then moving to the next tree in the row, then the next row and the next. 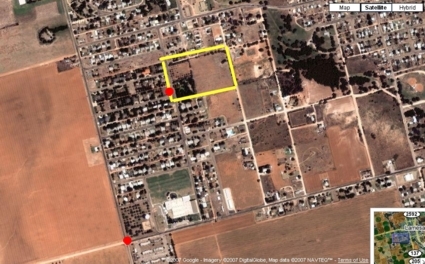 Here's a photo not mine — from Google's satellite map images. I've marked the larger property in a yellow rectangle, and you can see the heavily treed portion as a dark green rectangle in its bottom left quarter. The points from which my two photos were taken are marked with red dots. Eventually, in the late 1970s (while I was in college), my dad and step-mom built their dream-house amidst those trees, on a spot that my dad had penciled into the plan from the beginning. You can't really see the house from the road, and that was very much his intention. It's a nice house, although it's far from the biggest or the fanciest in town. 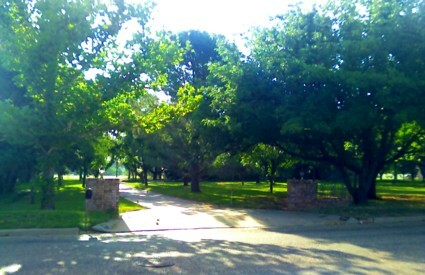 But there aren't many houses inside the city limits of Lamesa, Texas, that are completely blocked from view from the road just by trees, so that makes it pretty special. And the inferences you'd probably naturally draw about my dad, just from comparing the second and third photographs here, and without reading anything else I've written about him in this post or elsewhere on my blog — well, then, you'd probably be mostly correct in those. These trees can tell you a lot about my dad if you also value trees. And if you can see flat, empty land, and have the vision to imagine it transformed. And if, whether you have it yourself or not, you can appreciate the patience required to see that through. Every time I drive to Lamesa, those trees remind me of things about my dad that I've never forgotten, but that I'm nonetheless glad to hear from them again. Sorry you didn't stop by Midland, just too much to do in Lamesa I suppose! The windmill farms are proliferating rapidly and although in theory a good idea for the future are considered by many to be environmental pollution. Near Abilene and especially McCamey they are huge and can be seen for 40 miles or so. A tough choice between clean energy and ruining some of the last uncluttered skies in America. Wallace, thanks for the comment. I often pass through the Tall City when flying home (via Midland-Odessa plus a rental car), but the driving route straight up U.S. 87 via Big Spring is a few miles shorter coming from Houston. The towers aren't as ugly as I'd have thought, although that's of course a matter of personal opinion on which reasonable minds can vary. In particular, the moving blades make them much more interesting to me than, say, plain old electric transmission towers. But I confess that my opinion might change if I had to look at them every day; these were the first I'd seen in person, and one really gets no sense of their scale, unfortunately, from my poor cell-phone snapshots. 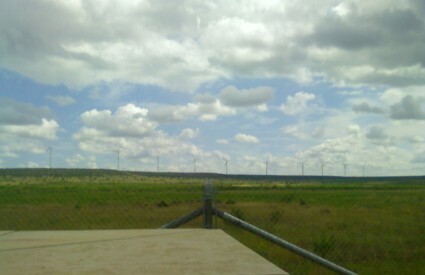 Check out the McCamey area windfarms. They are humongous and sit on top of the mesa's that used to be a spectaclular uncluttered vista. The farms stretch for miles. "The towers aren't as ugly as I'd have thought, although that's of course a matter of personal opinion on which reasonable minds can vary." Unreasonable minds, too -- the type that see unspoiled nature as superior to any form of human presence. Unless you love vistas of flat, featureless tableland I cannot see how a wind farm is going to ugly it up. I always got depressed when "bidness" took me to high plains Texas. I'd probably have gone up to your dad's door, and pretended to be a door-to-door salesman or pollster just to escape the plains into an arboreal horizon for a few minutes. I've driven through Lamesa many times, taking US180 from Phoenix to Dallas. I've always wondered, why aren't the streets oriented NS and EW along the section lines, as they are in the other towns in the region? Glad you were back on the Llano Estacado. Next time, lunch...perhaps Orlando's? Except that we're in Missouri, our dogs could be kin. Our Shiloh looks just like your Weiss - including his tongue, which has a black diagonal stripe, and some black spots as well. His pink skin also has many black "freckles". We adopted him from our local shelter in 1995; he's now 13 years old, and feeling a little tired around the edges. Our research into his physical characteristics indicated he could be a mixture of white shepherd (a Canadian breed) and shina inu - a Japanese breed which, along with the pink/black tongue, has a love of leaping into the air, especially when greeting his people. Really amazing to see another dog so much like ours - glasses raised to Weiss and Shiloh, and may she also enjoy a long life. Enjoy your blog - that second photo, above, looks like the intersection where Tom Hanks was in the last scene of the film "Cast Away".